Good news everyone! There is significantly more free WiFi at Dragon*Con in 2013 than in past years. Every one of the official host hotels has some free WiFi in the lobby areas. Of the six official host locations, only AmericasMart requires that you pay to use WiFi in the public areas. The down side of free WiFi is it gets horribly overloaded with all the gadget-wielding con-goers. Do not expect huge bandwidth, and video streaming of any kind is right out. I noticed several occasions last year when the Hilton’s lobby WiFi completely crashed (and then came back in a few minutes), presumably because of this overloading. But for simple web browsing, social media and email, the free options usually work. If you do need to work around a troublesome hotel wireless situation, there are several other locations nearby where you can get free WiFi – as long as you are willing to venture outside the host venues. I did some exploring and found eight free and open WiFi locations, and several others that require a password that’s easy to get (e.g. ask your server in a restaurant). Please keep in mind these are all associated with businesses, and they would appreciate your support. At least buy a Coke or a coffee or something before using their bandwidth! Americas Mart has pay WiFi throughout the Dealer & Exhibit halls, see below. Hilton has free WiFi in the lobby & public areas, see below. Hyatt has free WiFi in lobby, see below. Marriott has free WiFi in the lobby areas, see below. Peachtree Center Food Court, 303 Peachtree (“PeachtreeCenter”) No login required. Sheraton offers free WiFi in lobby, see below. Sun Trust Plaza at 303 Peachtree (just off the direct walkway from the Marriott to the Hyatt) has an Xfinity / CableWiFi hotspot – you’ll need an Xfinity, Cox, Time Warner, Optimum or Bright House customer account to log in. Westin has free WiFi in the lobby areas at (“Westin Lobby”), see below. 100 Peachtree is off the beaten path (beyond the southwest corner of the map above), but it has an Xfinity / CableWiFi hotspot – you’ll need an Xfinity, Cox, Time Warner, Optimum or Bright House customer account to log in. 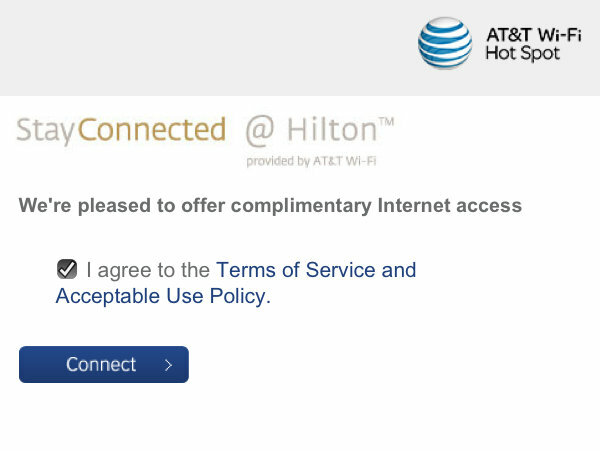 A typical screen shown as you connect to free WiFi – this is the one from the Hilton. Check the box and click the button to continue using the Internet. Note that almost all of these require you to log in using a web browser (and probably accept some terms of service legalese) before using the wireless. Some even ask for your name. Many newer devices (iPhone, iPad and so on) will display this screen for you automatically upon connecting. On older devices you may need to open a web browser manually to click the “I accept” button or equivalent. Keep that in mind if you are trying to check your email or Twitter – if it’s not working you need to open a browser to get past this screen first. If the free WiFi options get overloaded, sometimes a good strategy is to find a non-free location to log in. The theory is the cost will guarantee there will be fewer freeloading users there and you may get a better connection. AT&T: At the Hilton Hotel, go up to the 5th, 12th or 19th floor to one of the “Space Lounges” where there is a place to sit right off the elevators. (This gets you away from the overloaded free WiFi in the lobby). Use the SSID “attwifi”. At the login web page follow the prompts to log in with your AT&T account. You may also want to try the Starbucks at 240 Peachtree (across from the Hyatt). Bright House: Two locations: Sun Trust Plaza at 303 Peachtree (just off the direct walkway from Marriott to Hyatt) and also at 100 Peachtree. SSID: “CableWiFi” then click “Not an XFINITY Internet customer?” at bottom of login screen. Cox Cable: Two locations: Sun Trust Plaza at 303 Peachtree (just off the direct walkway from Marriott to Hyatt) and also at 100 Peachtree. SSID: “CableWiFi” then click “Not an XFINITY Internet customer?” at bottom of login screen. Optimum: Two locations: Sun Trust Plaza at 303 Peachtree (just off the direct walkway from Marriott to Hyatt) and also at 100 Peachtree. SSID: “CableWiFi” then click “Not an XFINITY Internet customer?” at bottom of login screen. Time Warner Cable: Two locations: Sun Trust Plaza at 303 Peachtree (just off the direct walkway from Marriott to Hyatt) and also at 100 Peachtree. SSID: “CableWiFi” then click “Not an XFINITY Internet customer?” at bottom of login screen. For the CableWiFi/Xfinity hotspots, note that Sun Trust Plaza has a food court accessible off the tunnel from the Marriott to the Hyatt, that provides some seating, but the doors may be locked on the weekend, because it is an office complex. Hilton provides free WiFi in the lobby areas of the hotel. You can use the SSID of “hhonors_lobby” or “attwifi” – it’s the same system. You must click through a web page with an agreement, but it remembers your device for 24 hours. The lobby WiFi does work in many of the track rooms on the second through fourth floor, but the further you get from the central atrium the weaker it is. I found the signal exists but is weak in the ballrooms such as Grand Ballroom, Salon and Crystal Ballroom. Try to sit closest to the lobby in those rooms if you need the free WiFi while attending a session. (Refer to the Hilton maps starting on page 81 in the Pocket Program Guide to see the layout – usually the back of the room is closest to the lobby). Up in the hotel use “hhonors” or “attwifi” and you will be charged, unless your room is on an Executive Level or your Hilton HHonors membership is Gold or Diamond. Because AT&T/Wayport runs it for the hotel, if you have an AT&T wireless plan you can log in with that at no extra charge. Just follow the prompts on the login screen. (And as mentioned above, the Space Lounges on the 5th, 12th and 19th floors just off the elevators, provide a good place for non-guests to use the AT&T system away from the crowds in the lobby). If you do have to pay, you can bill it to your room or a credit card, it’s $12.95 for 24 hours per device. One trick to this that I’ve had reported and seen work myself – connect to “attwifi” in the lobby first, using the free option there. Then go upstairs and it seems like it will let you roam without having to log into the pay WiFi upstairs. The Hilton has a new computer lab for guests near the back of the lobby area on the left, there are four PCs and four Macs. Not sure if this will be accessible during the con as they usually put a food vendor there, but if so it’s an alternative to the public computers at the Sheraton. Expect to wait for access. The Hyatt provides it’s own free wireless (SSID: “Hyatt Lobby”) in the lobby areas. It only really seems to work well in the lobby proper, as soon as you go to lower levels it drops off radically – and so I wouldn’t expect to use it in any track room. Hyatt explicitly disclaims their own WiFi coverage in their meeting rooms, which are mostly on the lower levels of the hotel. (Also see the 3G/4G section below). The wireless for hotel guests (SSID: “Hyatt Guestroom”) is $9.95 for 24 hours per device. They also have a higher speed option at $12.95. There’s also a “Hyatt Regency Meeting” hotspot, but this requires a code just like the other hotels, so don’t try it. This hotel is directly across Courtland Street from the Hilton and is often the center of evening activities due to its large atrium lobby and many bars. In the past the WiFi here was provided by iBAHN and offered the ability to log in using accounts from other systems like Boingo. But that system is gone – so no more using your account from home to save money. Free access is available in the lobby areas (SSID: “Marriott_Lobby”). It does extend down to the lowest level (International Level) and somewhat into the ballrooms that adjoin the lobby. But I wouldn’t expect it to work deep inside the ballrooms or in any room distant from the atrium lobby. If you expect to use WiFi while in a track session, check the Marriott maps starting on page 74 of the Pocket Program Guide to see which rooms are closest to the central atrium. Inside the guest rooms (SSID: “Marriott_GUEST”) the Internet is $14.95 per day ($16.50 including taxes, up $2 from last year) for basic email & web access; or $18.95 for up to 3x faster high speed access. This can cover up to 5 different devices for the same room. If you are Marriott Rewards Gold or Platinum Elite member, your wireless is free. The hotel guest WiFi does reach down to the top level of the lobby for roaming purposes, but not much further. Note that like the Hilton, the Marriott has separate access points for meetings which provide free WiFi to participants, these are named “Marriott_CONFERENCE”. Don’t bother with these, as Dragon*Con has not paid the Marriott to enable them. This hotel has free WiFi (SSID: “Link @ Sheraton”) in the lobby areas. It gives you access for 2 hours. After the first 2 hours of free access, it will force you to log back for another 2 hours in but according to the Sheraton employees, there’s no additional fee. The lobby WiFi definitely extends to the area outside the Grand Ballroom, but in my experiments it didn’t really reach inside that room or any of the other track rooms either. The lower level rooms like Georgia and Capitol (where registration is held) are practically wireless dead zones, so be aware before you get in a long registration line. Sheraton also has a nice open access computer area one floor above the lobby next to the coffee shop, with eight computers and a printer that guests can use. I would expect these to be overloaded with users during the convention, but might be useful in a pinch. There is also a separate WiFi in the rooms (SSID: “Sheraton_GuestRoom”) which is $12.95 for 24 hours per device (up $1 from last year). These access points don’t seem to cover into the lobby or meeting room areas, so I wouldn’t plan on using them while outside your room. The Westin has WiFi in the lobby areas (SSID: “Westin Lobby”) which is now free (it was pay last year). It may reach into some of the meeting rooms that adjoin the lobby, but I wouldn’t count on it. (Please report your experiences). Check the Westin maps starting on page 87 of the Pocket Program Guide to see which meeting rooms are closest to the circular lobby area. Hotel room Internet at the Westin is $14.95 per day per device. Like the Marriott and Hilton, the Westin also runs other access points like “Westin Meeting” for specific groups meeting in the hotel. Those will not be useful for Dragon*Con participants. New for 2013, the Dealer and Exhibit Halls are in AmericasMart building 1, which is at 240 Peachtree Street, across and a little bit south of the Hyatt. The two floors DragonCon is using are covered by the AmericasMart’s WiFi, which is provided by iBAHN. Unfortunately it is not free – it is the only main host venue that does not have free WiFi. Connect to SSID “AmericasMart” and you will get a login screen that shows what parts of the facility are covered. The service is $8.95 for 24 hours per device, and you can pay with Visa, MasterCard or American Express. (There’s also an option called “Unlimited Market” but as far as I can determine, that does not apply during DragonCon). You might be considering relying on the 3G/4G coverage of your mobile device, possibly including tethering your laptop or tablet to it. Atlanta has 4G of all flavors now, including WiMax from Clear, Sprint, Comcast and others and LTE from AT&T, Verizon and Sprint. I’ve used both Sprint and Clear from windowed rooms in the Hilton quite successfully in past years. Relying on 3G/4G can work, but there are some gotchas. Particularly in the Hyatt (and to a lesser extent the Marriott) many of the smaller meeting rooms (such as the track rooms) are fairly deep inside the building. Some are technically in basement or even sub-basement levels. Bottom line: until you actually try it out, don’t assume your wireless Internet service on your mobile device will work in any particular room that doesn’t have windows. In particular, check the Hyatt map on page 68, and the Marriott map on page 74 of the Pocket Program Guide to see which rooms are on the lowest levels. Most of the meeting rooms in the Hilton and Westin are higher in the hotel, and some have windows, so you may have better luck there. In most of the track rooms, particularly the smaller ones, there are usually several electric outlets available. The key is finding a seat near a wall where you can reach one. Make sure you get there early for popular programming. As happens in airports, the available outlets might get claimed before you get there. I covered other tips on keeping your devices powered up at a convention in my convention gadget guide last week. Please try to communicate safely and securely while you are at Dragon*Con. I do computer security stuff in my day job, and this is serious stuff. Fake WiFi access points are a major technique to steal people’s credentials, hijack their accounts and so on. With tens of thousands of people at Dragon*Con, I wouldn’t be surprised if someone tries to do it somewhere in downtown Atlanta during the event. If you don’t believe me, attend some sessions at the EFF Track in the Hilton and they will put some fear into you. Don’t connect to WiFi access points you see at DragonCon other than the ones I list here, unless you personally know (and trust) the person or organization who is running it. If you can use the 3G/4G on your device instead of WiFi in a given location at the convention, use it. Those signals are somewhat harder to spoof or tap. (But if you are worried about that happening, make sure you turn off data roaming on your device). For any website that has this feature (Twitter, Facebook, etc) activate the option to always use HTTPS instead of regular HTTP. Usually this is in your account settings or security settings on the site. Same thing with any Smartphone apps that you use regularly – go into the settings and pick the most secure options. For websites that don’t do this automatically, the Electronic Frontier Foundation has created Chrome and Firefox plugins called HTTPS Everywhere. Use them. Don’t use the same password on multiple services. Don’t use short passwords that are easy to guess. Use a password manager to securely keep track of your passwords for you. Be very wary of browser security error messages or unexpected requests to enter your password while online at the event. It might be an attempt to phish you. Close your browser and disconnect if you are unsure. There are plenty of ways to stay connected via WiFi and other forms of wireless Internet while attending Dragon*Con 2013. Make good use of them to maximize the value you get out of the weekend. Please comment or email or tweet me if you notice anything I got wrong or have additional information. If I get information during the convention I’ll relay it via Twitter. To get those updates and more, you can follow me on Twitter here. Updated August 26: Added a section about computer security while at the event. What an incredible guide. Thanks for scoping this out for everyone! This is a phenomenal guide to available connectivity; thank you! 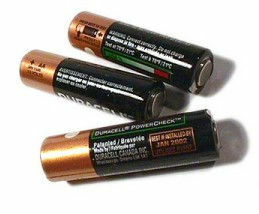 I see you mention external batteries in your convention gadget guide post; I’d reiterate that here for anyone not clicking the link. I bought one explicitly for the con last year, and I was extremely glad I did. Kept my phone working all day in spite of weak signals and heavy use, without tying me to an outlet. Prices on these seem to have come down a lot in the last year, too. Something I should mention that in the meeting rooms at the Sheraton on the main level has very spotty 3G/4G access. It seems that the only service that works in those meeting rooms is Verizon, and anyone with a Metro PCS phone might have coverage. I know AT&T and Sprint does not work, but I haven’t heard about Clear, T-Mobile or any other carriers. Thank you for the information about the free Wi-Fi access since I have been curious about that for a while! Thanks for that. In an ideal world I’d take a team of folks around and test the signal strength in every single track room for each carrier. Maybe I should throw up a Google Form and have people send in reports and just crowdsource it that way. The Boingo site lists America’s Mart as one of their spots. Not sure if it’s the entire thing, though. Hmmm, I don’t see that on Boingo’s web site. But I’ve seen iBAHN (which provides the WiFi for America’s Mart) allow logins with other providers before – last year you could do that at the Marriott. I did poke around on the iBAHN login page at America’s Mart and I could not see a way to tell it to log in with Boingo. If it’s there it’s well hidden. The Boingo site is still listing the Marriott Marquis as being included in their service … did the hotel tell you or guest of the hotel try it and it didn’t work? Just curious because I’m a Boingo user. I tried it myself from more than one device in different spots in the hotel – I could find no way to log in to Boingo, unfortunately. The very first panel we’re running this year is about how your wifi can be monitored passively (http://eff.dragoncon.org/2013/08/10/passive-wi-fi-monitoring/). If your job requires travel and net connections, and if you have sensitive info, it can be gotten. BTW, did you check to see if any hotspots were offering 5Ghz, or just 2.4? A lot of people can’t do 5, so it may be less likely to crash under the load. No unfortunately I didn’t have time to check frequencies. Those sessions sound great, I’ll try to make one or both. ATT 3G coverage is notoriously bad throughout most of PTC, especially inside the buildings. You may get a signal if you stand at the glass or if you are outside. It may work better if you can get up higher or go to the north side of the hotel row, i.e. Baker street. Nobody I know has ATT 4G so no comment on that. Verizon 4G LTE: coverage is excellent but it saturates quickly. Bandwidth was already down to almost zero Thursday before the con. Midday Friday it’s completely gone. Can’t even tweet. The fix for this would be to get far enough away to use some other tower. Sprint 3G: coverage is excellent but huge bandwidth issues even without a con. Sprint used to be great down here but it went downhill when the iPhone was released on Sprint. Sprint 4G Wimax: forget it. It may work outdoors, for example above the PTC mall. It will not work inside. Sprint 4G LTE: worse than the wimax coverage; drops back to 3G which is somehow bandwidth restricted compared to regular 3G. T-Mobile: Very good coverage, even reaches deep into the bowels of the Hyatt. Good bandwidth. 4G coverage also good. Wifi: The PTC mall wifi is awful even when nobody is using it. The main access point is located at the little guest services booth and you need to be right on top of it to get much of a signal. There is another access point closer to the Subway/CVS end but it has even worse range. You MAY try either of these access points from above as well. The courtyard has big glass skylights that should allow someone sitting on the benches outside to reach the interior wifi. Computer rental: Fedex in the Hyatt, Marriott and Hilton all have computer workstations to rent by the hour. Not cheap but they are there. Not sure if they let you plug in your own ethernet. No review of PTC is complete without a set of warnings about the food. There are a few great places to eat, several good places, and a few you must avoid. The locals who work here know. We have to deal with this food every day. So here goes with the off-limits warnings. You’ll survive all the other options so worry about what not to do: Great Wraps, the pizza place next to ChicFilA, Malibu Wings, GLC, the Indian food place, and Moe’s. These are all places that serve either just awful food that has no flavor or they have made people sick. The pizza is just reheated from whatever didn’t sell the day before. NOBODY who works down here eats there. Great Wraps is bland AND rude. Malibu Wings is bland and greasy. Both GLC and the Indian food shop have good food but cleanliness issues I will not get into make it impossible to eat there. The Moes down here is easily the worst Moes of all time. Stay far away. Remember, if there is no line at a restaurant, it means something. It does not mean go get in line. Cafe Momo is decent but do realize it is not all-you-can eat buffet. It’s pay by weight. They truly don’t care what’s in the box or if you mixed salad and meat, or breakfast entrees and fruit. They only care how heavy it is. Some people want to explain every item they picked. No. Just put it on the scale and pay. Excellent info, thanks! I myself noticed how terrible the food court WiFi can be today at lunch.